Christina Esposito tries to evade a defender. The junior attacker led the Wildcats with 3 goals in Sunday’s loss to Maryland. When playing an undefeated team, you have to be perfect. On Sunday, the Wildcats fell just short of that mark. No. 1 seed Maryland (19-0, 5-0 Big Ten) edged No. 3 seed Northwestern (10-9, 3-2) 12-9 in the Big Ten Tournament championship at Martin Stadium in a fierce battle of possession and momentum. The perennial powerhouses — who combined have won 10 of the last 11 national championships — had four ties and lead changes in the title game before the Terrapins pulled away on a 5-0 run in the second half. With the loss, the Cats are not granted an automatic bid to the NCAA Tournament but remain eligible for tournament play with a record above .500. Earlier in the season, the Terrapins dominated the Cats 17-4; Sunday’s game saw a much more even playing field, with the game decided by a handful of turnovers and missed opportunities. The Cats started the game aggressively. After freshman goalie Mallory Weisse nabbed two point-blank saves, sophomore midfielder Selena Lasota dodged her way around the Maryland defense and finished in front of the crease. From there, it was a game of runs. 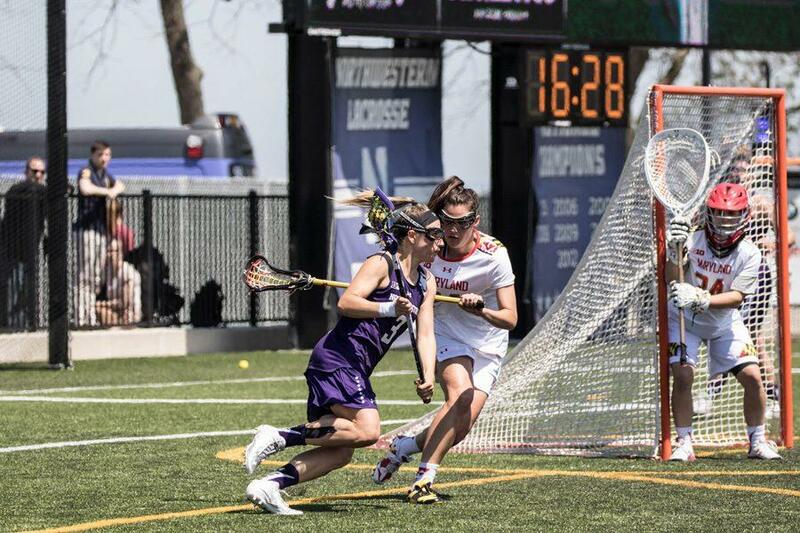 Maryland rocketed out on a 4-0 run before NU battled back to regain a 5-4 lead, winning a series of draw controls and tallying 4 goals in 2 and a half minutes. After trading goals back and forth with Maryland, Esposito found junior attacker Danita Stroup on the crease to tie the game 7-7 early in the second half. Over the next 13 minutes, Maryland methodically scored 5 times, including a controversial goal to begin the run. The Cats, on the other hand, were unable to capitalize on hard-earned possessions, committing key turnovers in the midfield and attacking sphere. Despite a frenzied, last minute pair of goals for the Cats, Maryland’s run proved to be too great. In a game of nearly-identical statistics, senior attacker Kaleigh Craig said that it was momentum shifts that cost the Cats the game. Defeat aside, Sunday’s matchup displayed a marked improvement for the Cats. In the teams’ last three meetings before Sunday, Maryland had outscored NU 50-14. Esposito said this improvement is indicative of something the team has been saying all year: Their best lacrosse is yet to come.